"We could not continue the way we were operating if we wanted to maintain a competitive edge," says Melvin, who has managed the small general airport for about 10 years. "We worried that we'd have to send customers away if we could not dispense the fuel. Losing customers was not a viable option." Located in Edinburg, TX, not far from the Mexican border, much of EBG's traffic comes from the Texas State Police and U.S. Border Patrol. Between 2006 and 2013, fuel sales skyrocketed-from 14,000 gallons to 430,000 gallons-taxing the airport's small and inefficient underground fuel system. Design Engineering: Argus Consulting Co.
Project Management/Oversight: TX Dept. of Transportation, Aviation Div. 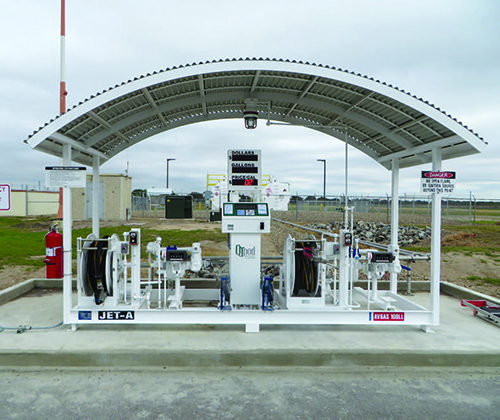 Pervasive operational strains led EBG to perform a $1.36 million upgrade, installing two 12,000-gallon aboveground tanks-one for Jet-A and one for Avgas-with bulk loading and dispensing capabilities. In addition to significantly reducing the time it takes to fill the airport's refueling truck, the new system also allows pilots using credit cards to self-dispense fuel 24/7. Construction spanned five months, from July to December 2015; and the new facility opened for business in early 2016. The Texas Department of Transportation (TxDOT) paid 75% of the cost, and the city of Edinburg paid 25%, through a non-primary entitlement grant. The need for a new fuel facility didn't happen overnight. Melvin first saw the writing on the wall when the Texas Department of Public Safety's Aviation Division rented a hangar in 2008 to house one helicopter and then quickly added three more. A few years later, the U.S. Border Patrol and Texas Air National Guard started using EBG for its border operations as well. "We were dispensing large quantities of fuel, and it took us three to four hours to reload a 3,000-gallon mobile refueler," Melvin recalls. "You can just imagine the ineffectiveness." Sometimes, employees had to work overtime just to meet the demand. "This dramatic increase in traffic triggered the need to improve our fuel dispensing facilities," she explains. "The system was obsolete, ineffective and undergoing repeated repairs. With the new system, we can reload the mobile refueler in about 10 to 15 minutes, dispensing at 200 gallons per minute compared to the old 11 gallons per minute." Argus Consulting, design engineer for the project, based the facility design on specifications provided by TxDOT. The new system sits near the northeast side of the apron, about 420 feet from where the former system was located. "Airport administration wanted to relocate it away from the aircraft maneuver area on the ramp," explains Garrett Gjerstad, PE, project manager with Argus. The facility's base includes a concrete foundation that is curbed on all sides. "If a valve is left open or a tank ruptures, all of the fuel would go into a storm inlet and then into the concrete containment system," explains Gjerstad. Two pump skids-one for Jet-A and another for Avgas-were also installed. 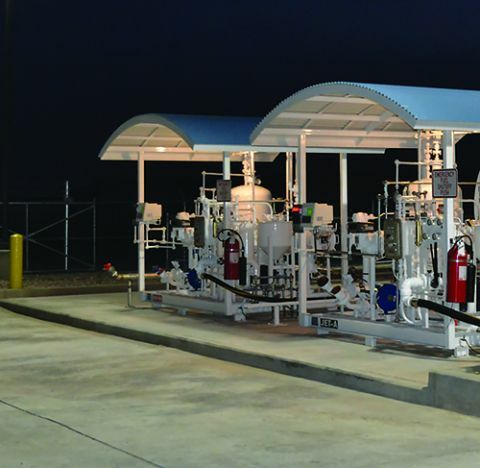 The bulk loading/unloading skid has a 200-gallon-per-minute pump and filtration skid with recirculation capabilities. The combined over-wing dispensing skid can pump at a rate of 30 gallons per minute and includes a 24/7 self-service credit card reader manufactured by QT Pod. 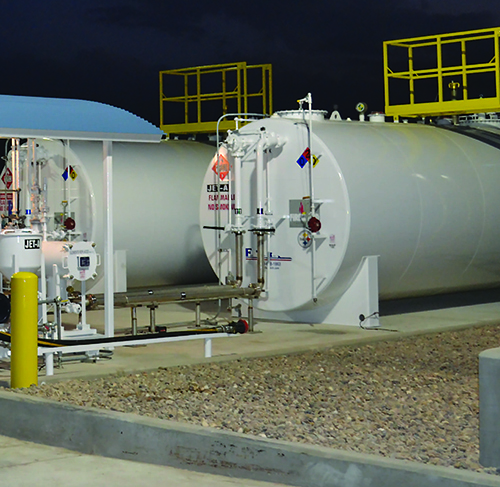 The pump and dispensing skids were pre-manufactured by Fuel Tech and shipped to the airport for installation. Because EBG is located so close to the Gulf of Mexico, project designers needed to make allowances for the salty sea air. "We had to modify the coatings on the equipment to protect it from the elements," Gjerstad says. "All of the aboveground pilings needed to be stainless steel, and the skids and tanks needed a protective epoxy exterior coating to protect it from corrosion and rust." Landside tanks are located in a 10,500-square-foot area surrounded by security fencing. Aboveground piping leads to the airside dispensing station about 150 feet away. "The distance minimizes the collision risk with planes," explains Rowdy O'Grady, project manager for general contractor Seneca Companies. A new road allows for easier offloading of tanker trucks. Opting for 12,000-gallon tanks has proved to be cost-effective for the airport, which now lays claim to the lowest fuel prices within 65 nautical miles. "Twelve thousand gallons is a magical number," explains Melvin. "Now, we can place an order for a full load every time, which brings down the unit price per load." Avgas is delivered from Houston and/or Louisiana about once every two months. Jet-A fuel arrives from San Antonio about four times a month. O'Grady agrees about the significance of tank size: "It is important to make sure you have enough capacity to take a full tanker load so you can lower your costs." TxDOT Project Manager Edward Mayle notes that the EBG project is one of the largest fuel system upgrades in the state. "It was fairly complex with the number of systems it included," he says. "Coupled with the poor condition of the existing system, we were really rushing to get it completed before they had something go wrong with their existing system." One of the new facility's major advantages is speed, notes Mayle. "This particular system can pump fuel out of the tankers at a very high rate, and it can also pump fuel into the mobile refueler at a high rate of speed. The mobile refueler can be filled in minutes. It is state-of-the-art." Crews decommissioned the airport's 22-year-old underground fuel facility without any problems, reports Melvin. Removing the old system created more ramp space and enhanced traffic flow. Now, EBG's ramp is large enough to accommodate Gulfstreams. "We are very thankful for the support of TxDOT Aviation and the city of Edinburg for providing the necessary resources to complete this crucial project," she notes. "Its long-term benefits include not only a strong economic impact but also position the airport for continued growth and business attraction."